Joseph could hardly believe it! I am sure his brothers couldnt either. Who would have ever guessed how things were going to turn out that day they sold their brother to a traveling Egyptian? But now all was forgiven, and they were a family again. There was just one, tiny, little problem. Joseph lived in Egypt - and the rest of his family lived in Canaan. That wouldnt work! Someone was going to have to move. Well, the problem was solved when Pharaoh heard the news that Joseph and his family were back together again. He was so happy for Joseph that he said to him, Tell your brothers to load up all their stuff and go back to Canaan. Tell them to get your father and their families and come back here and live with us! I promise that they will have the best land in all of Egypt. Wow! Pharaoh was really being generous! It's just that he was so grateful because Joseph had saved his country. Of course, it was really God who saved his country. But Joseph was God's faithful servant. And so Josephs brothers did just as they were told. Who wouldnt! Joseph gave them wagons and food for the trip, and he gave them new traveling clothes too. But he gave his favorite little brother Benjamin three hundred pieces of silver and FIVE new sets of clothes! Joseph also sent his father ten donkeys piled high with the best stuff in Egypt, and ten donkeys loaded with bread and cheese and frozen pizzas for the trip back home (well, maybe not the frozen pizzas - where would they cook them?!). Do you suppose he was thinking about what was going to happen when his older brothers found out that Benjamin got more than they did? The amazing thing is, the brothers didnt argue once the whole way home - and it is a LONG way. They really HAD changed! Poor old Jacob nearly fell over backwards. It couldnt be! Joseph was dead! He was torn apart by lions - at least thats what his brothers had told their father all those years ago. But then they took their old father by the arm and showed him the wagons, and the donkeys piled high with the finest goods from Egypt, and he knew it had to be true. Jacob loved his children so much. Well, love is what the Bible is all about. And so thats just what they did. Of course, this wasnt like mom and dad packing the family camel for a two week vacation. It was Jacob, and all his children, and all their wives, and all their children, picking up their tents and packing up everything they owned and moving to a new country. Imagine what that must have looked like! Jacob and his eleven sons, and all their wives, and all their children, with all their sheep and goats and cattle, traveling along the dusty road to Egypt. And its over 200 miles from Canaan to Egypt. Thats a long time to bounce up and down on a camel. They hadnt traveled very far when Jacob had to make a stop. ...from God, that is. This was a big deal - they were leaving the land that God had promised them. Was this what God wanted them to do? Jacob needed to ask God to lead him. And so Jacob made a stop at Beersheba. There was a well at Beersheba, and it was near the place where Jacob had that dream of angels going up and down a stairway to heaven. So Jacob stopped there and offered a sacrifice to God. As soon as Joseph heard that his father was coming, he jumped on his chariot and raced off to meet him. When he saw his father off in the distance - remember he hadnt seen his father in a long, long time - he drove his horses as fast as they could go. Before they had even come to a stop, Joseph jumped from his chariot and threw his arms around his father. He cried and cried for a very long time. Thats just what God is all about. God wants to take things that have come apart and put them back together again. Pharaoh was true to his word. 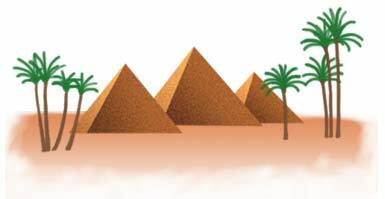 When Jacob and all his family arrived in Egypt, Pharaoh gave them the land of Goshen, the best land in all of Egypt. "My life of wandering has lasted one hundred and thirty years," Jacob told the Pharaoh. Now at last his wandering was over. Jacob, and his sons, and their wives, and all their children, and all their sheep and cattle settled down in their new home. And thats how Gods people came to live in the land of Egypt. Like 400 years or so. And then the story REALLY gets interesting.